About 7.9 million people received federally administered payments in December 2010. The average monthly payment in December 2010 was $501. Total payments for the year were more than $48 billion, including almost $4 billion in federally administered state supplementation. The majority were female (55 percent). Sixteen percent were under age 18, 58 percent were aged 18 to 64, and 26 percent were aged 65 or older. Most (85 percent) were eligible on the basis of a disability. 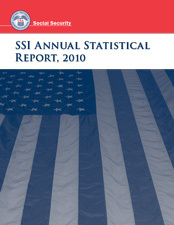 Thirty-four percent of SSI recipients also received Social Security benefits. Despite their disabilities, about 319,000 recipients (4.7 percent) were working in December 2010. Clark D. Pickett managed the preparation of this report. Sherry Barber, Stella Coleman, Art Kahn, Judi Papas, and Clark Pickett prepared the statistical tables and narratives. Staff of the Division of Information Resources edited the report and prepared the print and web versions for publication. In accordance with Public Law 111-256 (enacted October 2010), the terms "retardation" and "mental retardation" have been replaced by "intellectual disability." This change in terminology does not affect the data presented, which are directly comparable with the data published in previous editions under the old terminology. Beginning with this 2010 edition, tables showing data by diagnostic group provide detail for mental disorders in these categories: autistic disorders, developmental disorders, childhood and adolescent disorders not elsewhere classified, intellectual disability, mood disorders, organic mental disorders, schizophrenic and other psychotic disorders, and all other mental disorders. In a few instances, a table showing data by diagnostic group has been split into two companion tables to accommodate the additional detail.